The most ancient form of dance originated from the southern Indian state of Tamil nadu, named after Bharata Muni is Bharatanatyam. The dance is known for its perfect and graceful feminine movements. It resembles the movements of a dancing flame. It is the most beautiful form of expression, a dance form which holds pride in itself. An amalgamation of bhava, natya, thala and raga- expression, melody, rhythm & dance- accompanied by carnatic music, Bharatanatyam is also an act of devotion. It is a form of meditation, which allows you to ex-press your feelings to the world. Its dance forms are also used to present various themes such as unity of religions, nationalism, nature and emotions. Emotions are quite elegantly described as Abhinayas. The three main elements of Bharatnatyam are namely: Nritta (rhythmic dance movements). Natya (dance combined with a dramatic as-pect) and Nritya (union of Nritta and Natya). It has the largest number of movements; head(shiro bedas), neck(griva bedas), eye( dhrishti bedas), hands(mudras) and legs(adavus). The use of expressive hand gestures is called Mudras. There are two types of Hastas: Asamyukta and Samyukta (mudras with single and both hands). 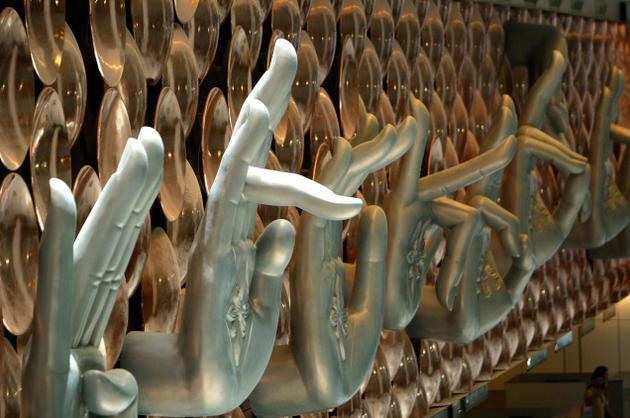 There are more than two hundred mudras. Some of them in-clude Chandrakala, Shukatundako, Khapitya. While the dance itself is appealing, what makes it more vibrant is the costume and makeup. A silk saree in pyjama style with a blouse and two or four fan shaped pieces supported by a unique piece of jewellery and ghungroo, con-stitute the attire. It is said that a Bharatanayam dancer develops the qualities of Javaha(Agility), Sthirath-vam(Steadiness), Bhramari(balance in pirouettes), Drishti(glance), Shramaha(hard work), Medha(intelligence), Shraddha(devotion), Vacho (good speech) & Geetam (singing ability). At present, Bharatanatyam is taken as a career by many. Many people choose to learn carnatic music along with Bharatanatyam as they go together. Most contemporary performances are given on the stage. However, "semi-classical" has acquired a special place in recent times due to depiction in movies and television programs. In short, Bharatanatyam is a sacred form of art that beautifully communicates emotions to the world. Sacred, Pure and beautiful just about sums it up!